The US, Canada and New Zealand have all moved to recognise Aboriginal people in their respective constitutions. But Australia is still struggling: politicians are adamant to go beyond symbolic gestures, and many Aboriginal people want a treaty instead. Worldwide, the US, Canada and New Zealand have all moved to recognise Aboriginal people in their respective constitutions. The United States Government has more than 350 treaties with Native Americans. Norway’s constitution recognises the country as bi-­cultural. "A glance at the constitution reveals the deep stain of racism and discrimination," says reputable journalist Jeff McMullen . "It is one of the few constitutions in the world today with negative race powers allowing government to make laws and policy that pointedly trample the rights of Aboriginal and Torres Strait Islander people." “Constitutionally speaking we are still basically White Australia, however much we boast that we have changed,” says former High Court Justice Michael Kirby . 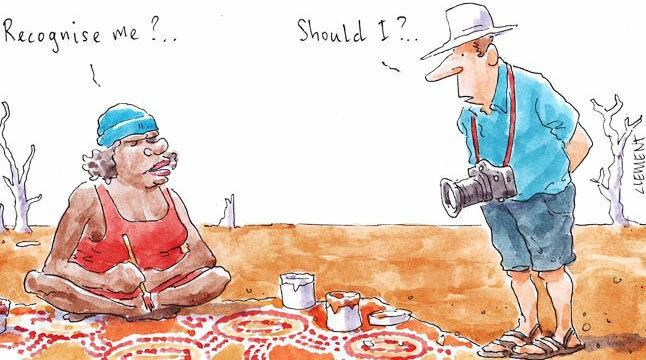 90% of surveyed Australians want Aboriginal people officially recognised . But Aboriginal Australians are not so sure. There is a big difference if Aboriginal people are recognised in the preamble or the body of the constitution. The preamble is not part of the constitution, and any change to it would have no legal consequences. Alternatively, inserting a statement of Aboriginal recognition into the constitution itself, would be interpreted by the courts, with the potential for outcomes at odds with today's understandings of the statement's purpose . "I don't want to resent any longer"
Aboriginal film-maker Rachel Perkins thinks that constitutional recognition could "lift the historical burden that sits like a heavy skin across our nation", causing resentment among Aboriginal people. Watch this video of The Weekly for a tongue-in-cheek view of the topic. Nationally efforts started in 2011 to have Aboriginal people recognised in Australia's constitution. Australia's constitution does not recognise Aboriginal or Torres Strait Islander peoples' prior occupation and custodianship of their land. In fact, section 51(xxvi) allows special laws to be passed to the disadvantage of Aboriginal people, and section 25 enables state laws to disqualify people of a particular race from voting at state elections. Add Section 51 (A) to recognise Aboriginal peoples' occupation of the land and continuing relationship with lands and water. The section would also pay respect to culture, language and heritage, and state that the government can only make laws to the benefit of Aboriginal people. Add Section 116A to specifically prohibit racial discrimination for all Australians. It would forbid any government from discriminating against a person based on race, colour, ethnicity or national origin. Add Section 127 (A) for recognition of languages and to acknowledge and protect the role that languages have in Aboriginal communities. On 13 February 2013, federal parliament passed an Act of Recognition which formally recognised the presence of Aboriginal and Torres Strait Islander people in Australia before white settlement. Also in 2013, the Australian government planned a nationwide referendum to recognise Aboriginal people in the preamble of the Constitution, but it shelved the plan later, citing low public support . It later slated the referendum for 2017, coinciding with the 50th anniversary of the 1967 Referendum, a plan that also didn't eventuate. Why do Aboriginal people reject constitutional recognition? There is a huge lack of trust towards the government and its campaign. Kombumerri woman and academic, Mary Graham, says that “constitutional recognition is a way of promising something, but with no real substance”. It's a view echoed in many communities throughout Australia. Even politicians know about this. Victorian Aboriginal Affairs Minister Natalie Hutchins, in her time in office, found communities "consistently" express opposition to constitutional recognition. And a "large and diverse audience" of 500 Aboriginal people unanimously rejected recognition in the constitution at a government consultation meeting in February 2016. There is also fear in the Aboriginal community that the government wants to use recognition as a distraction from the real problems. Gumbaynggirr historian Dr Gary Foley believes that the government just wants "to divert our attention from the real issues”. And Veteran Gunnai activist Robbie Thorpe told the Tracker newspaper that a focus on constitutional reform equates to “taking us onto the back of the White Australia Policy, 100 years later”. The government created the policy in order to create an all-white Australia. “Who gives a damn about whether we’re mentioned in the Australian Constitution," Foley says. "What real difference will it make? It’s a grand token gesture and will mean nothing in the long run, so it’s a waste of time for people to be even talking about it” . Others believe constitutional recognition could mean the end of the fight for a treaty. The thinking behind these statements is that, for many Aboriginal communities, the goal is not constitutional reform. The goal is sovereignty and a treaty. Fact Since the 1967 Federal Referendum, where voters decided to remove discriminating references, Aboriginal people are not mentioned in the Australian constitution. Fact South Australian campaigner Tauto Sansbury estimates that "60% to 70% of Aboriginal people are interested in treaties rather than constitutional change". Quiz: Which word does not occur in the Australian constitution? Unfortunately, the Australian Constitution was made entirely without 'love'. You can verify it here. Watch a panel discussion about "Constitutional Recognition of Australia's first peoples: Sell out or stepping stone?" where leading Aboriginal and non-Aboriginal public commentators discuss the suggested constitutional changes recommended by the "expert panel" and the related issues of land rights and sovereignty. Panelists include Prof. Kerry Arabena (Director & Chair of Indigenous Health, Onemda VicHealth Koori Health Unit, The University of Melbourne), Prof. George Williams (University of New South Wales), Chris Graham (Freelance Journalist and former and founding editor National Indigenous Times). Moderated by Melissa Castan (Monash University). Video commissioned by NITV and produced for Melbourne Conversations by Jeffrey Taylor, City of Melbourne. Thank you for your permission to feature the video here. Should self-determination be included in the Constitution? Geoff Clark, former chairman of the disbanded Aboriginal and Torres Strait Islander Commission, does not believe that self-determination needs to be included in the Constitution's preamble. "Aborigines probably already have the right of self-determination quite independent of the Australian Constitution," he says . He believes that any such inclusion would be "read down" by judges as has been done in the past with native title. Clark suggests to include a simple clause in the body of the Constitution "that the consent of the Aboriginal people is required for the application [of] laws and policies that may have an effect on Aboriginal people." Such a clause would have stopped the Northern Territory Intervention. The Ethiopian constitution of 1994 provides in Article 39 that ‘'Every nation, nationality or people in Ethiopia shall have the unrestricted right to self-determination up to secession'’. On 8 September 2010 New South Wales Premier Kristina Keneally introduced legislation to amend the preamble of the NSW constitution to formally recognise Aboriginal people as the first peoples in the state, and their contribution to the state's identity . The amendment followed a two-month consultation period with the public. The government insisted on the third paragraph to be included which makes the amendment symbolic only. South Australian Aboriginal peoples were the first in the nation to seek this constitutional recognition , but amendments to the constitution were only tabled in 2013 to SA’s lower and upper houses. Proclamation Day is celebrated each December at Gumtree Park in Adelaide’s Glenelg – the only event of its type in Australia. These states already recognise Aboriginal people in their constitutions. Victoria introduced the Constitution (Recognition of Aboriginal People) Act 2004 in August 2004 while Queensland ratified the Constitution (Preamble) Amendment Act 2010 early that year.